A team of astronomers in Garching, Germany, discovered a comet-like object in a distant galaxy 170 light-years from Earth that is similar in composition to the famed Halley’s comet — however, this one is about 100,000 times bigger. New Hubble Space Telescope findings are evidence for a belt of comet-like bodies orbiting the white dwarf, similar to our solar system’s Kuiper Belt. The international team of astronomers observed the white dwarf WD 1425+540 in the constellation Boötes (the Herdsman) . 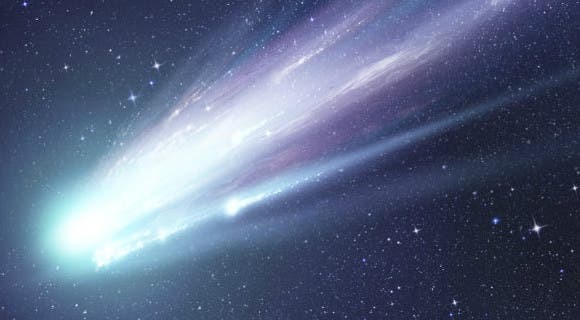 While studying the white dwarf’s atmosphere using both the NASA/ESA Hubble Space Telescope and the W. M. Keck Observatory the team found evidence that an object rather like a massive comet was falling onto the star, getting tidally disrupted while doing so. The team determined that the object had a chemical composition similar to the famous Halley’s Comet in our own Solar System, but it was 100 000 times more massive and had twice the proportion of water as its local counterpart. Spectral analysis showed that the destroyed object was rich in the elements essential for life, including carbon, oxygen, sulphur and even nitrogen . There are already more than a dozen white dwarfs known to be polluted with infalling debris from rocky, asteroid-like objects, but this is the first time a body made of icy, comet-like material has been seen polluting a white dwarf’s atmosphere. These findings are evidence for a belt of comet-like bodies, similar to our Solar System’s Kuiper Belt, orbiting the white dwarf. These icy bodies apparently survived the star’s evolution from a main sequence star — similar to our Sun — to a red giant and its final collapse to a small, dense white dwarf. The team that made this discovery also considered how this massive object got from its original, distant orbit onto a collision course with its parent star. The change in the orbit could have been caused by the gravitational distribution by so far undetected, surviving planets which have perturbed the belt of comets. Another explanation could be that the companion star of the white dwarf disturbed the belt and caused objects from the belt to travel toward the white dwarf. The change in orbit could also have been caused by a combination of these two scenarios. Siyi Xu of the European Southern Observatory, who led the team that made the discovery, says this is the first time nitrogen has been detected in the planetary debris that falls onto a white dwarf. NASA's First Encounter With the 'Last Planet' –"A New Class of Worlds"
White-Dwarf Solar System Discovered That Mirrors Ours –"Rich in Life's Building Blocks"